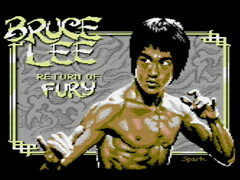 Return of Fury is a continuation of the original game Bruce Lee, developed by DataSoft Inc, in 1984. It features all of the classic gameplay, but now in a brand new world. The improvements were made by Vidar Bang, Rune Spaans, Anders Rodahl, Kåre Johansen, Roy Widding, Andrew Fisher, Vinny Mainolfi, Chris Stanley, Tom Roger Skauen and Paul Hughes.